Xavier Institute of Communications PG Diploma Admission 2019 - Xavier Institute of Communications has invited applications for admission to the Post Graduate Diploma Courses in XIC for the Academic year 2019-20. The admissions will be made through Xavier Institute of Communications Online Entrance Test (OET) 2019. Xavier Institute of Communications, Mumbai is an authority who conducts XIC OET (Online Entrance Test) 2019 for aspirants looking to get admission into Post-graduate Diploma Courses. Online registration for XIC OET 2019 will commence from 01st April to 22nd April 2019. Candidates must ensure that they are eligible according to the eligibility norms of the institute before they proceed with the application procedure. 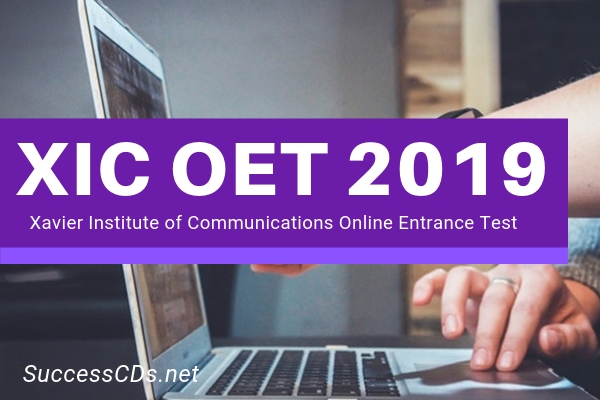 In this section, you will get the updates for XIC OET 2019: Application Form, Eligibility, Pattern, Dates, Syllabus. Xavier Institute of Communications conducts Xavier Institute of Communications Entrance Exam 2019 every year for admission in the PG Courses offered by the Institute. The admission will be made through Xavier Institute of Communication Online Entrance Test (OET) 2019. The exam is an Online Test that is conducted for 150 marks. The XIC OET 2019 is a combination of objective and subjective questions. Candidates need to ensure that they fulfill the eligibility criteria before they start filling the online application form. It is necessary to check the eligibility criteria as if the candidate is found not eligible even if he/she has submitted the application form for the exam, the candidature of such candidate will be cancelled. The candidates will be selected on the basis of their performance in the Online Test and Skype Interview. After the online test results are declared, only those who attain a minimum qualifying mark as laid down by the XIC Academic Board will be called for a Personal Interview via a ‘SKYPE’ Video Interview. (S V I). This SKYPE video interview will be conducted immediately after the completion of the Online Test and probably at the same OET Centre. For few courses rather than SVI, there shall be a Group discussion and Personal Interview. Candidates who will qualify in the online test will be intimated by Test Supervisor about the SVI. Such candidates would have to make arrangements to stay back / wait for an added hour (at least) till the “Skype Video Interview” is done. NOTE: “SKYPE VIDEO INTERVIEW” will be conducted for candidates applying for the following: Journalism (JR), Film & TV (FT), Advertising (AM), and Communication for Development (C4D) Courses only. The admit card for XIC OET 2019 will be issued to only those candidates who will register for the entrance test. The Admit card will be sent to his/her registered email ID as mentioned in the Registration Form. sometimes, the admit card can also be in your Spam/ Junk Folders too, so do check it there also. Download and take a printout of the admit card. It is mandatory for students to bring their admit card to appear for the entrance test. No candidate will be allowed to sit for the exam without an admit card. Objective Section: This section carries 100 marks and will be of 60 minutes. It will consist of questions related to Language Skills, General Knowledge and Knowledge of Media, Logical and Analytical skills. Subjective Section: This section carries 50 marks and will be 30 minutes. This section will consist of three questions which could be media related in order to assess your creativity, social values, writing skills, etc. Some questions could also be related to the Course you are applying for. Based on the overall performance of the candidate, a final list of candidates will be published on XIC Website and the XIC Notice Boards. To check the XIC OET result online, you will need to have your registration number with yourself. The result posted will have your reference number, name etc. The result will be available online only and no scorecard or result of the candidate will be sent by post/ courier. All the eligible candidates will apply online for Online Entrance Test (OET) for taking admission to Post Graduate Diploma Courses. Fill all the details as required for registration. After you have successfully registered, you may start filling in all the details and upload a scanned copy of recent passport size photograph in the application form. On completion, an Application Number will be generated, note it down and preserve it carefully. Now, you can finally make a payment. Payments can be made by using Bank DEBIT or Credit Cards. Ensure that these Cards are NET- BANKING ENABLED.